Australian Warehouse Solutions presents a new range of taping machines in the Australian market designed to automatically seal cartons with packaging tape. Stocked by AWS in two models, Rhino carton taping machines deliver speed, efficiency and productivity, with the ability to tape at 23 metres per minute covering 12 – 20 cartons. Model Rhino 103SD taping machines apply tape to a fixed size box but can cater for a variety of different sized boxes, using a simple no-tool adjustment made by the operator. Model Rhino 105SDR Side Drive randomly seals any size carton by sensing the box size and automatically adjusting to that size before taping commences. 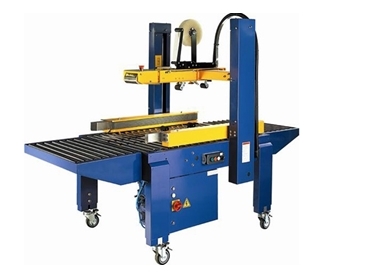 Featuring a rugged steel construction designed for 24/7 operation, Rhino taping machines are built on tough, industrial wheels that provide easy mobility and will fit into an existing conveyor or packaging line. Both machines have a unique cassette tape loading system that totally eliminates stoppages for tape changes. For added safety, the tape sealer allows easy access to all moving parts and comes with an optional safety cover. Supplied ready for immediate use, Rhino carton taping machines can be simply plugged in and switched on. Rhino taping machines are also available in stainless steel models for the food industry as well as versions that include safety cages and automatic carton closing. Additionally, Rhino tapes are available in jumbo 1000m rolls and are stocked in all AWS branches. Known for their strength, durability and excellent pricing, Rhino tapes feature a unique natural rubber formulation that delivers trouble-free performance on both conventional and recycled boxes, from freezing temperatures in Canberra to sweltering heat and humidity in the tropical north. AWS specialises in providing innovative and cost-effective packaging solutions at its branches in Sydney, Melbourne and Brisbane.